we are looking for active, level 85 players who are interested in growing and contributing to our alliance! players will get han and gk shards, and have the opportunity to participate in hSTRs a couple times a month in our ticket alt guild that will be up and running once CG updates the STR! The Corellian Refugees, an independent guild, has room for 2 new members! Looking for 2M+, and RJT-ready. We're a relaxed yet dedicated group, free of drama. You'll find that we're more about community than we are compliance - rules are simple, and we succeed as a team. GP is 112M at 48/50, and rising by over 1M/week. 36 stars in each TB, with increases each time. Players who join tend to stick around, and many of us have been here together for over a year. Discord is our official communication channel (keithereal#8467). 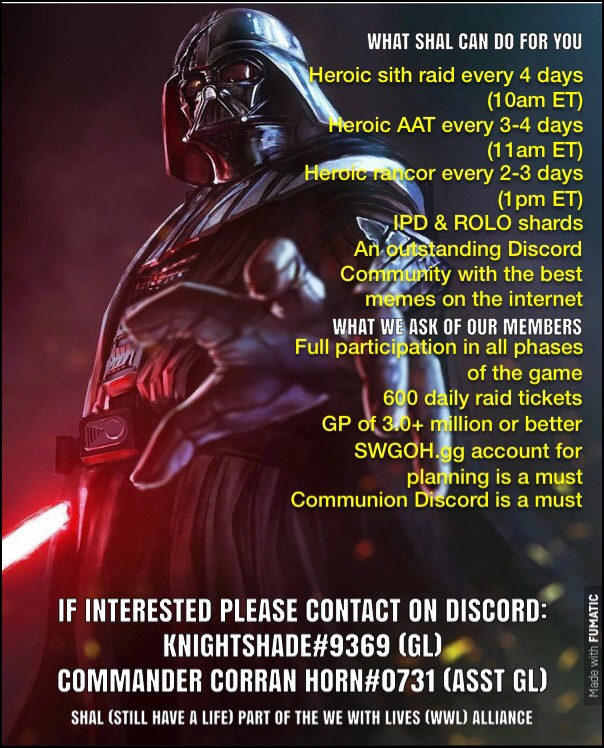 PM me here or there for more details, providing swgoh.gg or ally code, or visit https://discord.gg/X9jrktQ. Hope to have you join us! Are you an active player? Close to ready for the heroic sith raid? We want you! Nerfherder Union is currently looking to replace a few inactive members to help push us towards HSTR. We could make room for 2-3 players right now or after TW. We are a pretty relaxed but active guild looking for members who are motivated and are keen to play with a like-minded group of people. We are currently focused on building teams towards heroic str. We usually do about 90 ROLO shards and 36 (and increasing each time) IPD shards. Guild reset is 7.30pm central and we have players from all over the US and other countries too. Raids start at 8pm central rotating HRancor and HAAT on alternate days with 24 hour join periods. Sith raid: we are currently doing T5 (ffa) and are highly focused on building teams to get to heroic. We have already done T6, and will be attempting heroic in September. Hello everyone I am from the guild The Schwartz ours is Bigger. Our GP is 99 million. We do HPIT, HAAT, and Tier 5 SR and are going to move to tier 6 very soon. We have around 20 TW wins and get about 36 stars in both TB. Ally invite 286-625-767 (username WoklingWizard) and we can invite you. Thank you for your consideration. The KøR Republic Order Rebels are accepting new recruits to our ranks ready to face Treya and start earning that valuable T12 raid gear. Do you have what it takes? Are you worthy to be a Knight øf Ren and ready to be a Republic Order Rebel? We will also accept any smaller guild wishing to merge with us. If the Guild Leader transfers, they will instantly be made an officer along with up to 2 others. Questions can also be asked the same way. We are looking for upcoming, active players for our (mostly) german guild called Brotherhood2017 (https://swgoh.gg/g/34593/brotherhood2017/). Most of the members speak english too. We are very communicative and helpful. We are very understanding when it comes to personal or job matters and the activity is temporarily lesser. Sorry for my english. I hope its understandable. Feel free to ask in PMs. ◦	Raids: Heroic Rancor (done in few hours); Normal Tank (done in 1 day), Sith Tier 4 (done in one week). We are a very united and active team but not that extremely like others. Most of us are from Venezuela but we are open for more new members from others countries also. ◦	Player level 75 or higher. ◦	24hrs of 0 damage Heroic Rancor. ◦ AAT and Sith Raid immediately restart when finished or tickets available. 150+mil gp guild looking for members who are top 5 on their arenas. Gp is not so important but you need to have some TW teams and all the meta characters. Also we are doing HSR and keep doing it regularly. Find me from the game please. • US East coast schedule, but we have members from all over. • We run and complete HPit 3x/week, and HAAT 2x/week, they are launched throughout the day to ensure they are accessible to each player across all time zones. HPit is an easy-farm status for us with HAAT taking a little longer as to be expected, both HPIT and HAAT have 24hr join windows in which members can post a 0 to ensure we all earn rewards. We’re still building necessary STR squads, and we complete STR 3 in good time to not waste tickets. Bonus raids will be undertaken as and when we can launch them! • TB 20-24*. TW over 50% win rate in the 50M+ GP bracket. TB and TW is low as we don’t have strict requirements for them. 1. Have a Line account and contact myself (Line ID: BattledKnight) to get added to the Ewokolypse family of guilds chat rooms. 2. Ensure your in-game SWGOH name matches your Line ID so we know who we’re talking to and who to contact. 3. Produce the maximum of 600 daily raid tickets, which is easily achieved by spending earned energy daily (a few easily achieved energy refreshes may typically be needed). 4. Contact somebody if you will not be able to produce 400-600 daily tickets (vacation, work, IPAs won a drinking contest against you, etc.) we are easy going and appreciate RL kicks in hard sometimes. 5. For HPit, if you can completely solo all 4 phases with a single team (what we refer to as a solo run), which nets a score of ~10.4 million, please wait one additional hour after the raid starts to post your score, so others can get their shot (make sure to start your run just prior to raid start). "Members who fail to participate in guild events, get their daily tickets, or be responsive on LINE CHAT may be removed from EO. We love all our members, but our guild is only as strong as the least active among us" BBEight, former EO leader. • We have no minimum level or GP requirements. We prefer raid ticket production over large character rosters (although both is good). We currently have 38/50 members, and are looking for at least 5 active players but welcome as many applications as possible. Below is our SWGOH link. Please contact me if you’re interested in joining the Ewokolypse family. 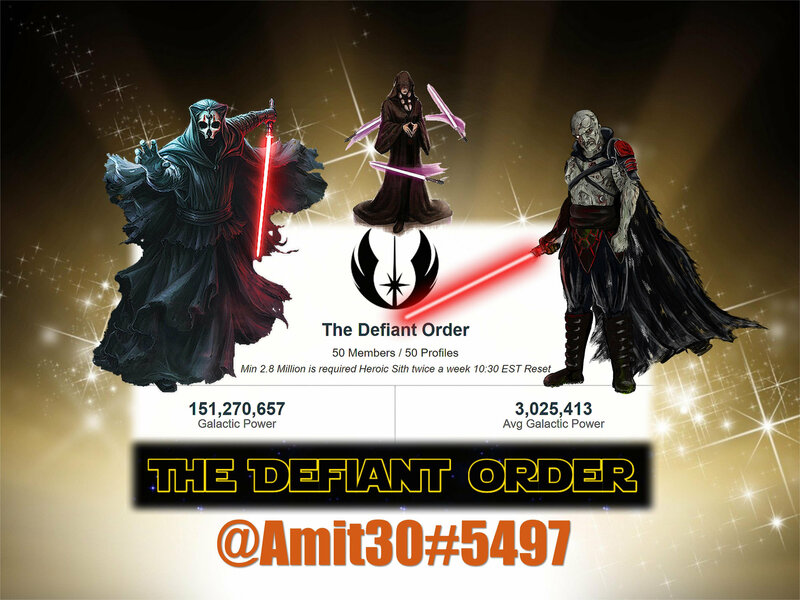 We are 155+ Million GP guild filled with high participation members, from TW, to TB to the heroic Sith Raid. Come To Traya Country. Come to SHAL. LP Padawans League is a mid level guild with 40 mil GP that currently looking to fill 3 or more open spots. We are very active and do Heroic Rancor 3 times per week on a regular schedule times per week. We also do HAAT 2 times a week also at set time. We do not have Sith on a set schedule yet but are running them as soon as we finish one and have tickets available. Currently running Sith at T3 as our focus right now is working on doing HAAT and getting everyone GK. Sith raid will be our next focus. We are an EST guild. We are pretty laid back in general but we are active and want members who are actively pursuing this game and trying to always improve. We are a learning and trying guild so we love to help people to learn the ends and outs of this game and strive to make you the best you can be. If interested or you have any questions please feel free to join our recruitment channel on discord where one of our officers will be happy to help you or message me directly. Beyond Omega is a newly formed European guild. We currently have 38 players and 47 M GP, a mix of experienced players and new people. We do Heroic Pit and Heroic AAT regularly, and we alternate between T4 and T5 sith raids (yes, this takes some time). In TB we get between 20 and 23 stars. We have plans to work towards Heroic sith raid, but this will obviously take extra people and some time. - No immediate GP requirements. I prefer an active, motivated player over someone who just has a lot of GP. - We have farming lists to prepare for Heroic Sith Raid (long term). New guild started by 2 experienced players looking for members! Looking for a change? This is the place you need to be. Fun guild based in the U.K. (GMT 00:00)2 mil GP required, will concentrate on TB and STR! Daily play and use of guild chat is a must. We don’t do outside chat rooms we spend our time playing! Places going fast ! Act now to secure your spot! The Notorious Few (https://swgoh.gg/g/7486/the-notorious-few/) runs heroic rancor and HAAT. We believe we are on the cusp of the heroic Sith raid, so you would jump in at a good time. We just did a run where we made it to 20% remaining phase 3, but our chex mix is where we need the most work, and we burned a lot of our filler squads pushing through the last 20% of phase 2. After a week of improvements we will try again after TB. (NOTE: we have a few people perfecting the nightsisters for P3. We will at least make it to P4 next heroic attempt, with the possibility of completing). We are based out of Pacific Time Zone, but we have players from all over the world. We are an active and fun group and Raid often. We rotate raid times between 12pm and 10pm CST to accommodate different schedules. We typically get 23-25k raid tickets daily. We have an active but laid back culture. We request that people in the guild at least deploy each phase for TB, but we realize that reality limits people from completing every battle every day. TW is optional, but those who sign up need to set up defense and/or attack on offense so they aren’t putting our guild at a GP disadvantage on matchups. Our GP as a guild is a little over 110 mil. We are at 34*-35* for TB depending on full participation and combat success. We are 34-3 in TW. Our decisions on potential players will be based on roster decision-making. We have a nice mix of whales, dolphins and ftp. Moving towards heroic sith raid. We are looking to add members with a with the same goals. We are active in all forms and encourage full participation without going overboard. We are the world's #1 free-to-play / f2p Star Wars Galaxy of Heroes guild! We have Traya shards on farm! YOU could have Traya shards on farm! We have to hold back Heroic Sith Raid damage to ensure all members get rewards! Our #1 rule is to get your 600 tickets daily. USE and ABUSE our council elders to make yourself the top of your arena shards! HAAT guild looking to absorb a group of roughly 10 members. We are an independent guild but we are open to discussing a merge that results in a two guild alliance and a shared discord server. Willing to convert an officer or 2 if a small guild wants to merg in. We are a friendly and active guild with a core group that has been together since the game started. We have Hpit and HAAT on farm at 9pm EST(subject to change as alot of players are just looking for gear and we clear in <45min). With this being said, we are not interested in merging into another guild, only to absorb a small group or for an Alliance as the main guild. We finish both DS and LS TB with 30 stars and however we did just lose 4 members looking for hstr. We win the majority of our Territory Wars. Currently clearing T4 /T5 Sith in just over a day and believe we can push further into the raid with the right players. Our current main goal as a guild is team building while gaining a better understanding of the STR in order to eventually push into heroic. Ideally, we are looking for members with a desire to grow their rosters for HSTR and Territory Battles. Looking for a minimum GP of 1.5 Million and willing to build HSTR teams. Willing to make exceptions for the right players. The majority of our members are North American but we do have some EU members as well. Discord and swgoh.gg is a must for raid discussion, TW/TB strategy and general banter. We tend to have a highly active group on there. - Looking for players that will be active most days and join the raids and TW. - we are constantly running raids. 140mm +GP fun and very active guild. We are currently looking for 1-2 active players that are addicted to the game. We are an independent focused, organized guild offering up a few spots for anyone wanting to farm HAAT, HRancor and TB while advising and having a laugh in the Line chat rooms we run. Oh, we also have heroic sith raid on farm!!! 600/600 required everyday. To be monitored but not enforced like a prison camp. -Use of the 'Line' app is mandatory. If you would like to apply, please add 'DarthReign' on the 'Line' app (also Darth Reign #4202 on discord). •	At least 450/600 daily energy. We start all raids at 8PM EST. We do Hpit, T6 AAT, and T4 Sith. We are working on getting to HAAT. 0 Damage in first 24 hours on Heroics. We have Line and Discord but they are not required. We want you to have fun. If you’re interested PM me or send me a Line message. My Line ID is mercede79. My ally code is 995-142-556. Knights of the Old Marauders is looking for active players to fill out the ranks of their roster! We are a casual, driven guild focusing on guild events and raids! Minimum lvl is 75 and discord chat is highly recommended! We have strong leadership, active players, and discord chat. If interested please dm Vass, Greenie Treenie, or EJ Guarddawg (Leader) in game or search for guild and join! Is looking for 13 active players (15 day’s inactivity may get booted if no notice has been given). We are family friendly and competitive. We do not have a level requirement, but need Territory War and Battle participation. We currently launch Heroic Pit and Heroic Tank raids as soon as tickets are available. Currently run tier 4 sith raid and hope to move up tier 5 very soon.